Let's embrace and celebrate our diversity. AMCIF is a discussion, networking and study group for raising awareness, consciousness, empathy and improving communication between faith groups internationally. Freedom, reason, empathy, respect and tolerance create a sacred space here. " I appreciate any organization or individual people who sincerely make an effort to promote harmony between humanity, and particularly harmony between the various religions. I consider it very sacred work and very important work"
Members of the Interfaith Forum believe in the rights of all people from all walks of life and cultures to practice their religious or other beliefs, regardless of what those beliefs are. Members may be Christian, Jew, Gentile, Agnostic, Atheist, Buddhist, Shinto, Pagan, Wiccan, Druid or even Dignity Catholics. We value diversity and respect each other, so long as those beliefs do not infringe upon the rights of others and are within the law of the land and one’s conscience. All religions and most spiritual belief systems are linked together by the common metaphysical and spiritual foundations. 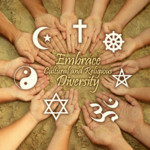 Link to or write interesting and related articles or stories that promote better interfaith relations and understanding. Use this group to connect with others who share your interest in interfaith dialogue, learning, understanding, greater awareness, empathy and possibly even friendship. Start a discussion, debate or question, regarding any religion, with a focus on how it may have a common bond with other religions or beliefs. A common foundation in most religions and spiritual beliefs is a metaphysical, mystical, or universal spiritual sense of connection. All paths focus on the power of love, and forgiveness. This may be a good area to start a discussion about what all beliefs have in common. Another area for discussion is around having common and basic universal 'laws' such as not killing, not stealing, etc.. Invite others who may have an interest in better interfaith relationships to join you here..
Click the red 'Invite Friends' button located to the right of this window, at the homepage of this group. To view all permanent Interfaith Multi-Cultural discussions or information, click on the small blue box labeled (permanent) below. These threads are never archived. bluePermanent To find out more about membership or co-hosting in this group, click on the small red/pink box below. Discussion (7) To see all threads, click on the small white box below. HIGH PRIORITY VIDEO...PLEASE SHARE FAR AND WIDE!